Youtube, it’s sort of a big deal. It’s only the 3rd most visited website in the world. There’s more than 35 hours of video uploaded per minute. The site serves up 3 billion video views per day! More and more businesses are taking advantage of Youtube’s existence and why not you used to have to pay for commercial time to get your videos in front of an audience. Today you can do it all from your home and by yourself is that not completely miraculous? Quit delaying this awesome opportunity for you business and jump in with both feet using our quick checklist. We’re keeping it short and simple only hitting the most important parts of each step. Use your main email address, or at least the main email address used in conjunction with your company. Confirm the email confirmation immediately and jump right in. Get this channel up to par. Upload a picture, your logo, location or any otherwise recognizable symbol, could be your face, who knows. Click on the Settings tab, you’ll notice you can change your Title, which is different than your channel name. Confused? Think of any webpage, it has a domain name and a page title. Add Channel Tags, these can get you huge traffic, so you may want to change your channel to NOT visible until you’ve uploaded a video or two. Don’t forget to hit the Save Changes button. Flip over to the Themes and Colors tab, use the advanced options to adjust colors as necessary. Aim to make your channel feel as much like your website as possible. Match the content font if you can and get background colors as close as possible, or if you know how to grab color hexes (hint: there are browser plugins that make this a 5 second process) match them exactly. Again, save your changes. You’ll find this in the left sidebar, click ‘edit’. Fill in everything you can but be certain to include the following: Name (if there’s no specific person then get creative and choose something witty), Style, Website, Channel Description (short and sweet), About, Location (pick your target audience’s Location) and Interests. Feel free to remove any field you don’t fill in. Whoa whoa whoa! Yep, we’re jumping right in. Make your first video, you might post a short video teaser introducing your channel. Make note that I said introducing your channel, not your business or product. You should be using Youtube on a regular basis, posting videos whenever it’s appropriate. Don’t make a big deal out of this video, production value can be highly overrated but give yourself plenty of practice time. Making videos always feels silly at first and naturally we’re all self conscious of how we present ourselves. Keep starting over until you get the video right, or if you have editing capabilities make sure you have enough good material to cut and paste together. Be certain people will understand what’s going on in the video and what’s being said, use subtitles if necessary. The Upload link is at the very top of your page at all times, presuming you’re logged in. From there it’s pretty straightforward, it can take a short while especially if you’re uploading high definition video. 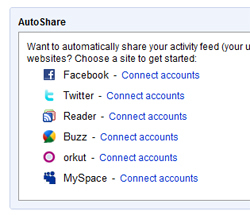 You’ll notice an AutoShare area on this Upload page and while you can connect accounts like Facebook and Twitter be sure to ask yourself if it’s the best way to handle sharing. There are more valuable ways to do so that perhaps we’ll explore in a future post. You’re going to have to name your video which will become the title by which it is identified. The title is extremely important so be sure it’s as accurately descriptive of the video content as it can be. Or if you want to get slightly advanced, use the title to target a keyphrase that you know is already being searched for. Add a good video description and always, always add video tags because as we know, tags equals traffic. Looking for even more ways to get traffic, try Derek Halpern’s video traffic academy webinar replay, you’ll find it’s chock full of traffic and lead generation tips. Subscribing – Subscribe to channels that relate to your business. Start with your allies, the other businesses you work with, the companies whose products you use and any quality channels you can find that your eventual subscribers might find interesting. Commenting – Don’t go overboard but every now and then comment appropriately on a video you find interesting or thought provoking. This will get you traffic and exposure over time. Liking – It’s easy, takes one second, do it when a video deserves it. Sharing – People from other social networks will learn you have Youtube by you sharing videos, whether yours or others. Again, don’t go overboard but don’t be afraid to share something interesting either. Quite possibly the most important point on this list. Consistency is key. Choose a schedule, plan your content, make it easy and simple and then stick to it. It gets easier and better with time. These are basic steps that I feel every business has to take to properly get started on Youtube. Youtube is still a huge and quite intricate platform and there’s a lot more you can learn and do using it.